Chief conservator of forests AP Singh said 5.22 lakh tourists visited Gir in the last year. This is the second highest number of tourists after 2015, when the number was 5.33 lakh. AHMEDABAD: From June 2016 to June 2017, the Gir forest clocked its highest ever revenue for a single year, collecting Rs 10.25 crore from 5.22 lakh tourists who visited the Gir sanctuary and the Devaliya interpretation zone.The rush continued and is evident this Diwali as well, with no online permits available for the vacation period till October 30. There are no online permit available on the weekends till January 14. Officials said that the tourist rush was increasing with every passing day. 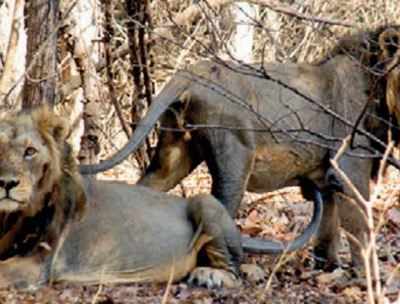 Chief conservator of forests A P Singh said 5.22 lakh tourists visited Gir in the last year. This is the second highest number of tourists after 2015, when the number was 5.33 lakh. "We are also expecting a huge rush during Diwali, as the park has just reopened after four months and it is the festival season." The Gir region in Saurashtra, which is the last habitat of the endangered Asiatic lion, has seen a rise in tourist numbers ever since the state tourism department launched a campaign featuring Bollywood actor Amitabh Bachchan. Sources in the department said that during the festive period, the number of permits has been increased from 90 to 150, but there is still a huge rush. The revenue thus collected is used for lion conservation. Officials expect the number of tourists to grow next year. The tourist season for Gir sanctuary is from October 15 to June 15. The park remains closed for the remainder of the year as the roads are not motorable.